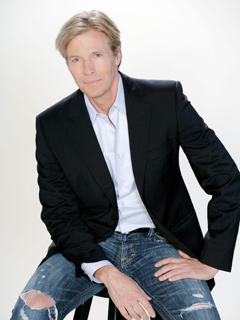 Jack Wagner was born and raised in Washington, Mo., where he took up golf at the age of 10 and planned on becoming a professional golfer. In his teens performing was just a hobby for him. He attended the University of Missouri for a year and won the state golf championship, and decided to apply for a golf scholarship to the University of Arizona. He didn’t get it, so he decided to audition for the drama program and won a full scholarship. From then on, Wagner focused much more of his attention on acting. Wagner was a theater major in college, and soon moved to Los Angeles. He landed his first role on the soap A NEW DAY IN EDEN. He appeared on KNOTS LANDING, and went on to star on GENERAL HOSPITAL, where he would meet his now ex-wife, Kristina, in the other half of supercouple Frisco and Felicia. In addition to television, Wagner has had a successful music career. His song “All I Need” was a No. 1 adult contemporary hit. He has starred on Broadway in WEST SIDE STORY, GREASE and JEKYLL & HYDE. Wagner helped develop a golf-themed talk show for ESPN called OFF COURSE WITH JACK WAGNER. He is a member of the Celebrity Players Tour, and is one of its top golfers. He is a supporter of AIDS research charities. Wagner lives in Los Angeles. In 2003, Wagner joined the cast of BOLD AND BEAUTIFUL as Dominick “Nick” Marone. Has a zero golf handicap. Worked as a tour guide for Universal Studios. His onscreen mother on B&B, Lesley-Anne Down (Jackie) is only five years older than he is in real life. Ranked No. 5 in the Top 10 Worst of the '80s by Canada's MuchMusic network.